I got a lot of great feedback about last week’s roundup of stories set to shape the week ahead. So, let’s do it again. I hope you enjoy this format and find it beneficial. Today’s Weekend Wire is tough because so much is happening. So much that could carry over and affect the market this coming week. Let’s start with the thing that DIDN’T happen. In other words, the dog didn’t raise a ruckus when someone stole the racehorse. And that tells you something. The dog that didn’t bark this week was the stock market. It did nothing when top White House economic adviser Larry Kudlow said he expects the Federal Reserve to pause its interest-rate increases for “quite some time” after an anticipated hike later this month. Holy Hound of the Baskervilles! For weeks, we’ve heard the market is under pressure because everyone is fearful of Fed rate hikes. Therefore, Kudlow’s announcement should have sparked a rally. Instead, the broad market — which has been under terrible pressure all week — folded its wings and fell further down the hole. The “nothing news” continued when Federal Reserve Bank of St. Louis President James Bullard said there was no reason to raise rates further. He implied that the Fed could delay its December hike, which is already priced in. Again, the dog didn’t bark. The market didn’t rally. If anything, it steepened its decline. My take: If the market doesn’t rally on “good news,” that tells you something. And that something is bad. Now, I would expect the market to rally sometime next week. But unless the fundamentals change, that is a rally that can be sold. Gold futures marked their highest settlement since July on Friday. It was the largest percentage gain since August. Why is gold rallying? Well, the dollar is weakening. The reasons for why THAT’S happening are a topic of much furious discussion and little agreement. Is it just one bad weekly jobs report? Is it the prospect of higher trade tariffs, as I told you last week? Or is the dollar finally heaving its last gasp before rolling over and plunging to a level with more fundamental support? 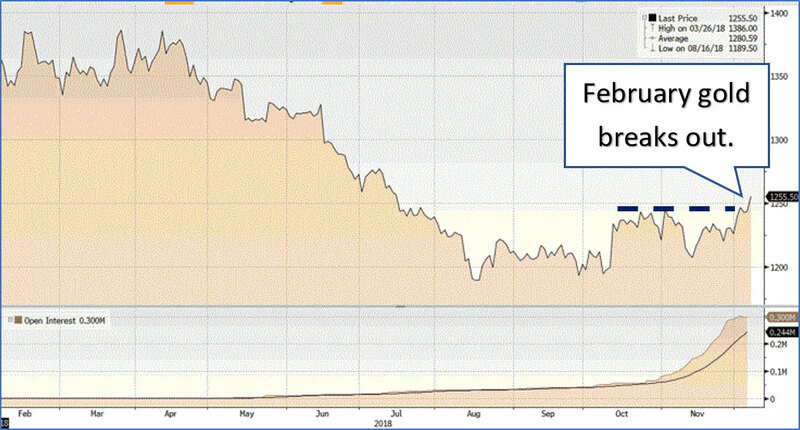 The actual gold price depends on whether you use the front-month contract, December, which is seeing declining volumes, or the more actively traded February contract. I’m going with February, because that’s where the action is. And the February gold price closed Friday solidly above $1,250. As this Bloomberg chart shows, you can see February’s gold price breaking out, and open interest surging. And something tells me that this breakout is real. That something is the very positive reaction from gold miners, developers and explorers. The good ones — and most of the others — are higher on the news, despite a broad market pullback. And is there more to come? I think so. 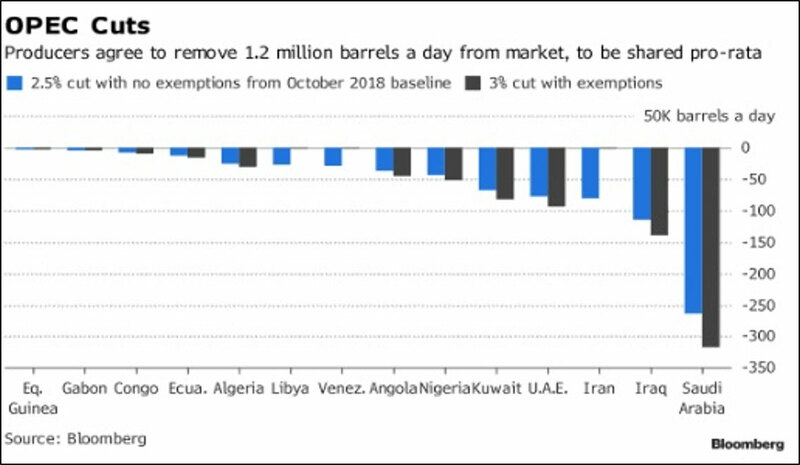 OPEC finally broke a deadlock over production curbs. The cartel inked a deal on a larger-than-expected cut with Russia-led allies to the tune of 1.2 million barrels a day. 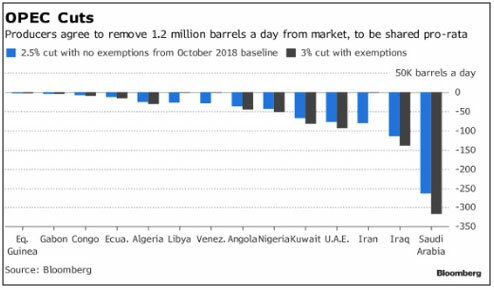 OPEC itself will cut by 800,000 barrels per day, doled out according to the chart below. The rest will come from Russia and its wonderful, wonderful friends. If you’re wondering why Iran isn’t cutting production, that’s because it hates Saudi Arabia with the white-hot intensity of a thousand desert suns. In fact, Iran tried very hard to torpedo this deal. But the rest of OPEC made Iran a deal it couldn’t refuse. Kapish? And yes, I know the formal spelling of that word is “capice.” Don’t write in about that, please. Anyway, OPEC has to do SOMETHING to prop up slumping oil prices. This is due to the oil producer who wasn’t at the table. Who’s that, do you ask? Finally, the U.S. became a net oil exporter last week for the first time in seven decades. This is squarely due to massive surge in production in the Permian Basin, the Bakken, the Marcellus and other fields. The fact is, the U.S. is the world’s largest petroleum producer. We have surpassed Saudi Arabia and Russia. We are the lead dog now. 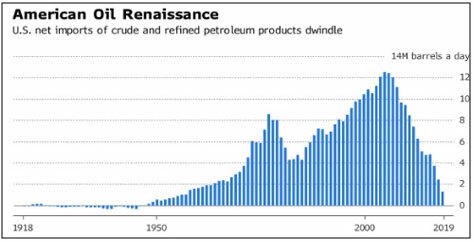 And if this trend continues, we are on the path to becoming the dominant energy power in the world. That’s why President Trump’s call for lower oil prices leaves many in the industry scratching their heads. I tell ya, Texas oilmen should be sending thank-you cards to OPEC right now. Oil rallied on the OPEC news, which is what you should see a healthy market do. My take is the oil market is healthier now than the broad market. And that may tell you about what kind of investments you want to make in the week going forward. Good luck and good trades. And I’ll see you next week. With Canadian production down over 30%, Alberta capping exports to 325kbbl/day, that means Canadian owned pipelines in the US might be underutilized. We might be able to buy oil from Sask. at prices where we can turn a profit, and possibly use some of the Canadian pipelines for transport. Instead of selling, I recommend building huge storage facilities near our northern border. Would give us a lot of choices and we can continue Bakken production in the same area. American may be an oil exporter, but at who’s expense? 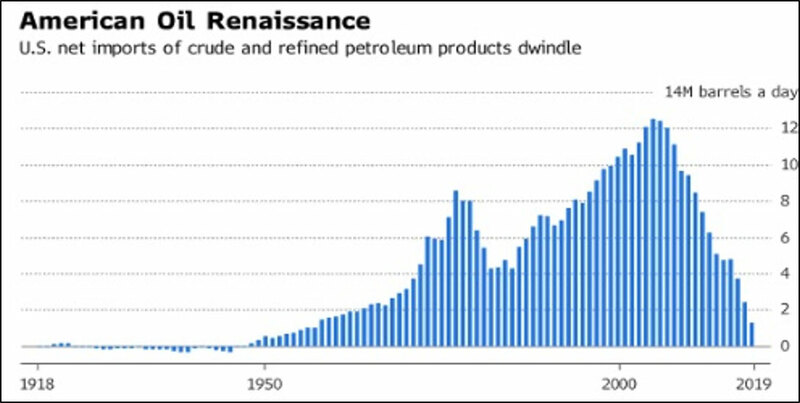 For all intent and purpose, the US has limited domestic oil production. Instead, it is stealing oil from Canada, refining it, and selling to foreign markets for a fat healthy profit, to pay for their BIG spending. Oh how wonderful to keep “American first,” or keep “America great” at the peril of others. Yes, it’s all about America first, and that’s not new. For anyone who’s been around for while knows these less than honorable practices are more alive and well today, as ever. In addition, who played a major role in preventing the Canadians from building an oil pipeline to tided water? Answer: the Americans, who providing funding and bus loads of protesters to the west coast in British Columbia. How disgusting!!! And now the latest catastrophe, doing America’s dirty work by arresting Huawei CFO on some questionable charges. Same stuff, different day. Sean, please don’t take this email personally, as I think you have an excellent understand of world events as they unfold over time. However, let’s not get too high on how wonderful and great America is with all it’s bully foreign policies, along with expecting all NATO nations to abide with their policies, thus interfering with other nations ability to carve out and establish their own foreign policies at they see fit. I will leave here, as I’ve said plenty in these few short sentences. You have a good day Sean.